JULY 2009 | SDTEKKEN.COM - TEKKEN News Resource! We’re VERY sorry for the lack of updates for this section as of late! July was a very hectic month with back to back to back events! We’re now back in full force to deliver daily TEKKEN news and content! Our friends at Tekken Zaibatsu has started updating the TEKKEN 6 character profile sections! Check it out here. SD TEKKEN and NAMCO BANDAI Games are teaming up to bring the TEKKEN 6 experience to Comic-Con in San Diego! Tekken fans and fighting gamers of all ages are welcome to join in on our 8th annual series of Tekken tournaments taking place from July 23 – 26! 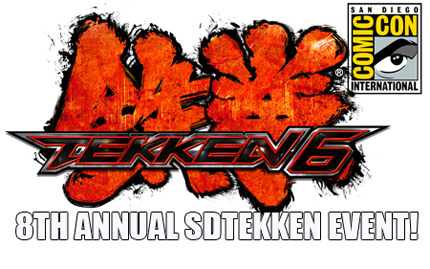 Don’t miss out on the prizes, giveaways and the chance to play the console versions of TEKKEN 6 before anyone else! For the full press release, click here. Our friends at Tekken Zaibatsu have uploaded more character profile CGs! Check it out here. From CHALLENGER.JP, a new Tekken 6: BR vid from Challenger! Check out this tournament match between Paul and Bob! Our friends at Tekken Zaibatsu has started uploading the TEKKEN 6 character CG files! Check it out here. BrisbaneTekken – Check out these vids from Brisbane, Australia! Some tournament vids between their rookie division!